This is our review of PureVPN, based on our real tests from China. Besides this PureVPN review, we have also reviewed a number of other VPN services. If you are looking for a reliable VPN services to be used in China, please also read our list of Best VPNs for China. If you are shopping for VPN to be used outside of China, you can take a look at this List of Best VPNs. Website blocked in China (no problem using PureVPN in China though). PureVPN is one of the very popular VPN providers with world-wide customers. They have VPN servers in many locations around the world. PureVPN’s main website, purevpn.com, is currently blocked in China. If you want to sign up from China, you might have to first use another VPN service to visit PureVPN’s website, or you can sign up from a country where it’s not blocked. However, once you’ve signed up and downloaded its VPN client, you can use PureVPN’s VPN service from China without major problems. Also, PureVPN has a couple of servers in China. For people outside of China looking for a VPN to get a China IP address in order to access China-only contents such as Youku and Tudou videos etc., PureVPN could be a good candidate. One nice thing about using PureVPN to get a China IP address is that once you have connected to PureVPN’s China servers, you can still access websites that are blocked in China (such as Google, Twitter, Facebook etc.). Therefore, if you are using PureVPN from outside of China to get a China IP, you normal web surfing won’t be disrupted due to China blocking. PureVPN has 500+ servers in 141 countries, including US, UK, Hong Kong, Japan, Taiwan, Singapore and many more. 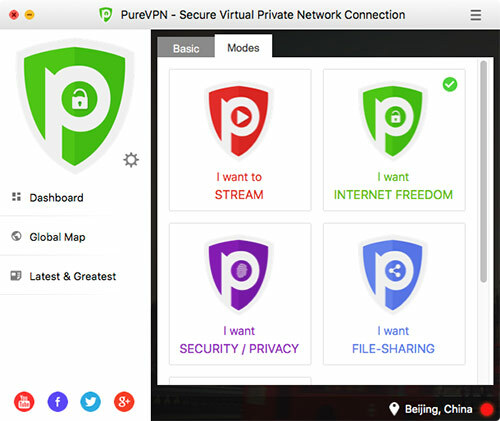 As mentioned earlier, PureVPN is one of the few VPN providers with servers in China. PureVPN supports the following connection protocols: PPTP, L2TP and OpenVPN. Please note that the its Mac client only support PPTP and L2TP (Users can set up OpenVPN manually on a Mac), while its Window client does support OpenVPN. 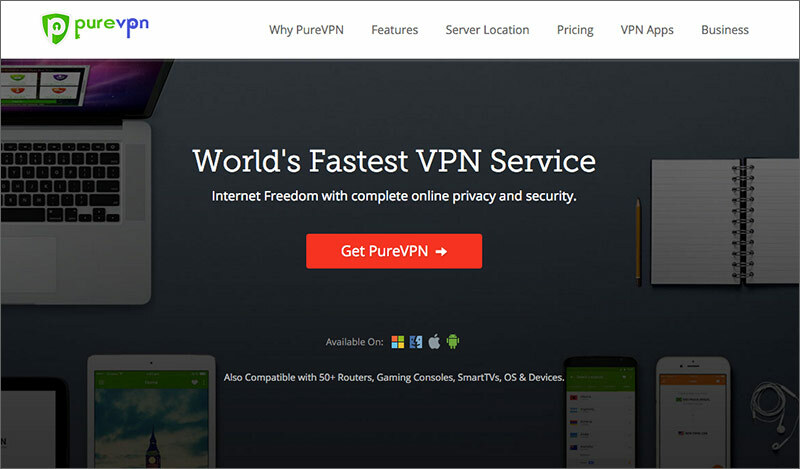 PureVPN provides free VPN software for Windows, Mac, Linux, IOS and Android. It also provides instructions on manual VPN set up, including on other devices such as Boxee, Ruko, PS3, Apple TV etc. PureVPN supports unlimited data transfer and unlimited server switching and claims to offer a 99.99% uptime. PureVPN has a useful feature called Split Tunneling, which allows users to choose which data to send through VPN and which data not to go through VPN. Note that this feature is available to PureVPN’s Windows client, but not available for Mac. As for P2P and file-sharing, PureVPN allows this kind of traffic on a number of servers while prohibits it on servers located in countries such as US, UK, Canada, Australia etc. Recently PureVPN added a new feature called Virtual Router, which allows users to convert their desktop or laptop computer into a virtual router and use it to connect up to 10 devices. Currently the virtual router feature is only available on PureVPN’s Windows desktop application. The price for PureVPN starts from $2.49/mo. It doesn’t offer any free trial, but instead offers a 7-day money-back guarantee for users to try out their VPN service. For simultaneous connections, PureVPN allows users to connect to up to 5 devices at the same time. This is quite generous as many VPN providers only allow 1 or 2. PureVPN provides free VPN software for many platforms, including Windows, Mac, Linux, IOS and Android etc. We downloaded their desktop client for Mac OS. The installation process was straight-forward and the software interface is clean. With the desktop software, you can connect/disconnect to VPN and also change servers from different locations or countries. Note that PureVPN’s Mac client software doesn’t include the OpenVPN connection type, while its Windows version does. This selection allows user to choose the optimized protocol and servers for different purposes. It’s well known that China has not only been blocking websites but also been heavily blocking VPN services, and VPN blocking in China has gotten tougher in recent year. 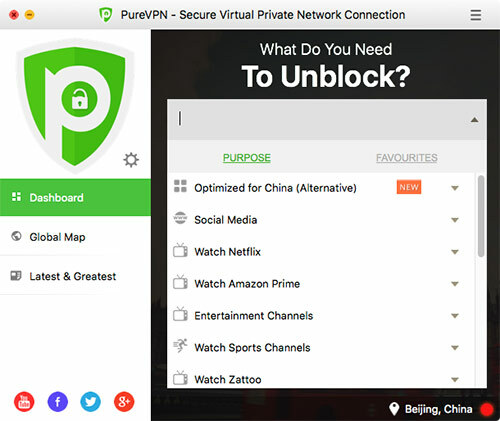 During periods of heavy VPN blocking, it might be difficult to connect to PureVPN from China even using its Internet Freedom mode. In these cases, the best option is to use PureVPN’s Dedicated IP mode and connect to its VPN servers manually. Once you have become a PureVPN user, you can get a list of dedicated IP addresses for China users to connect to. Just select the Dedicated IP mode from PureVPN’s desktop software and then enter one of the dedicated IP addresses, and you should be able to get connected. In addition, PureVPN’s customer service is pretty helpful to VPN users in China, when you have problems, just contact its customer support and mention you are an user in China, you should be able to get the most updated tips for solving your connection problems in China. Then we used PureVPN’s Mac desktop VPN client to connect to its Hong Kong server using the L2TP protocol. We got a download speed of 35.31 Mb/s, which was a very fast speed. On PureVPN’s website, there’s a live chat window for visitors and users to connect to their support team directly. We tried using live chat to talk to their support representative a number of times and every time we were able to get connected almost immediately and got our questions answered. PureVPN is one of the popular VPN providers, with many servers across many of countries to choose from. It even has a couple of servers located in China, making PureVPN a good choice for VPN into China – getting a China IP address from outside of China. It speed is decent and its 5 simultaneous connection offer is quite generous. PureVPN’s price is at the lower end compared to that of other many other VPN providers, which makes PureVPN one of the best cheap VPNs. PureVPN’s website is currently blocked in China, making it difficult to sign up for their service from China. However, you can use another VPN to visit their site to sign up, or sign up PureVPN from outside of China. 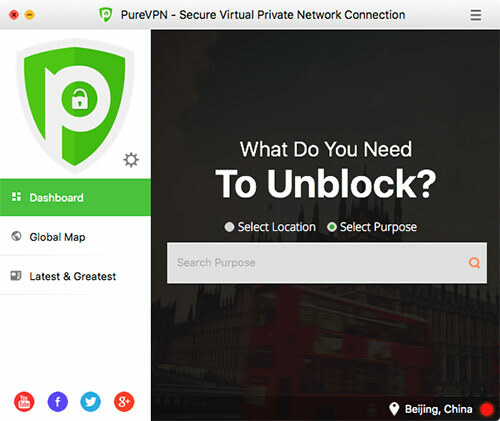 Once you’ve signed up and setup their VPN software, you can use PureVPN in China without having to use another VPN. This entry was posted in VPN Reviews and tagged purevpn, review. Bookmark the permalink.